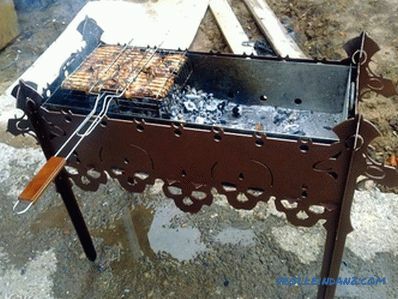 Cooking high-quality kebabs is impossible without special devices made in the form of a brazier and called barbecues by the people. Barbecue grills are particularly popular with meat lovers, as they are easily dismantled and can be transported unassembled in the trunk of a car. 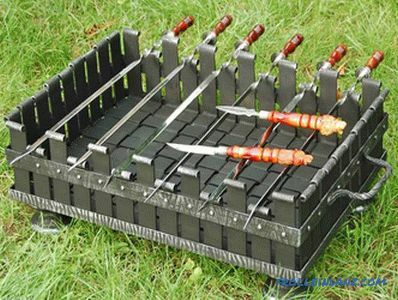 In this article we will look at how to make a collapsible grill with your own hands. 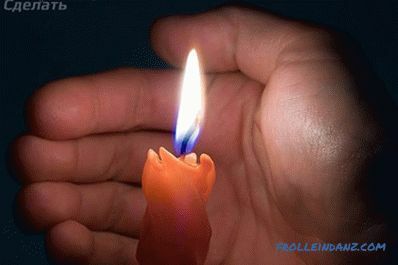 reliability in relation to fire safety. When choosing the dimensions of a future device, its characteristics are usually taken into account, such as the maximum number of skewers that you plan to place at the same time, as well as the size of the trunk of your car. Its width is chosen, as a rule, taking into account the size of the skewers at your disposal. 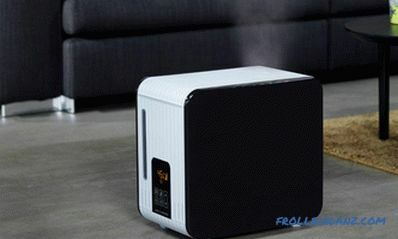 As for the height of the roaster, it should be selected on the basis of the possibility of obtaining a temperature sufficient for roasting meat (usually this value is selected in the range of 150-160 mm). the length of each of the 4 legs - 600 mm. Corner frame with fixing tubes. 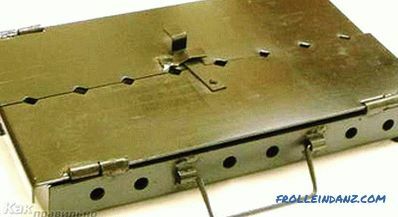 In addition, to assemble a structure, you will need standard fasteners, such as bolts, nuts and washers (simple and engraving). First of all a stand is being prepared in the form of a frame on which the brazier's frame and its legs will be subsequently fastened. It is made from billets of a steel corner of a certain size, which (after they are cut to the size of a barbecue) are welded into a rectangular structure - the frame, which is the basis of the future barbecue. Then along the inner edge of the corner (along the edges of the frame) are welded pipe sections with a diameter of about 17 mm, used as supports for the legs of the barbecue. For the manufacture of the legs themselves, you can use billets with a diameter of about 20 mm. 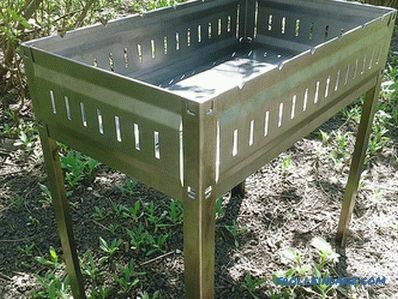 The bottom of the brazier is made of rectangular steel sheet with a thickness of 3 mm, in which holes are drilled using an electric drill, ensuring air circulation in the heating zone. For the manufacture of the rim, use sheet metal with wall thicknesses from 1.5 to 2 mm. After marking the side blanks to the size of the base and cutting them with a grinder, you can proceed to the preparation of seats. For this purpose, holes are prepared at the points of their attachment to the base, as well as in those places where the side walls are connected to one another. 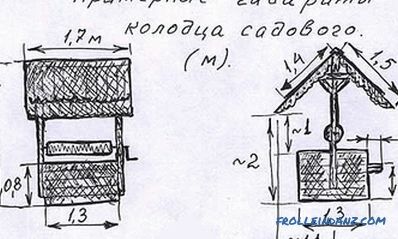 It is easiest to organize work on the production of grid-irons using a welding machine. For this you will need to prepare not very thick reinforcing bars and cut them with a grinder to the size of the grate bottom. 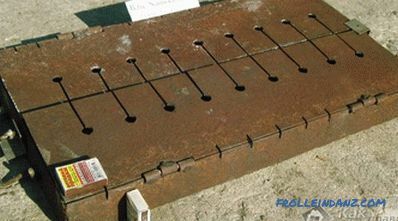 To obtain the bottom of the grate, these rods are simply welded in a grid. 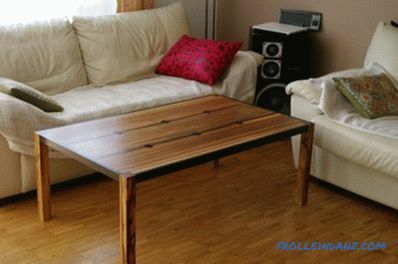 First of all, the previously prepared frame is connected to the base with bolts of the appropriate size. To obtain a reliable connection when installing bolts, it is advisable to use washers engraver. After that, it will be possible to mount legs on the basis of the barbecue. For their arrangement, previously prepared pipe supports with a diameter of 17 mm are "worn" sections of a pipe of larger diameter. Then we attach the beads and fasten them to the base and to each other using the same bolted joints. To increase the strength of the structure obtained, it is recommended to additionally fasten the walls with longitudinal spokes, which are then tightened with lamb nuts. At the end, all you have to do is to lay the ready grate on the bottom of the structure. Now you can safely get together with friends on nature, grabbing with is a disassembled construction of a brazier, a couple of kilograms of pickled meat and charcoal. If you made a grill in another way, share your experience with our readers, leaving comments on the article. 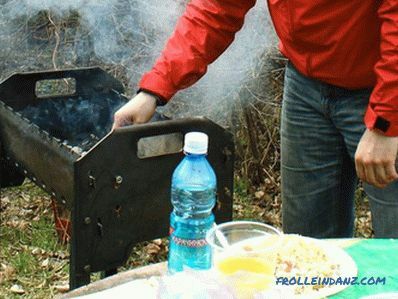 We offer to watch a video about the method of manufacturing the simplest design of the prefabricated barbecue.